The first time i went to middle school canteen when my hands hardly reaches to the marble counter top. I have seen the man behind counter & recognised hims as Muzaffar Bhai, thin, wheatish complexion man. 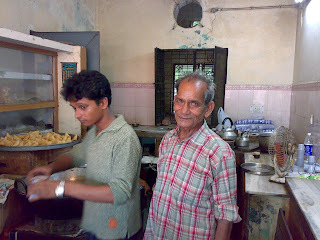 Expert in making samosa, jalebi, balushahi, namak para & gulab jamun. History repeats when i took my daughter with me. The man behind the counter was the same, however the hands that again reached to the counter was changed & i felt my childhood in my daughter. I shared the same with Muzaffar bhai, still thin, now dark complexion & spiders web on face. He has treated my daughter with same love as he used to treat me or other students. Life of middle school is incomplete without Muzaffar bhai. Although my daughter refused to drink tea there, but i had it with the same affection as it was many years back. You can find the taste at many places, but neither cups nor surroundings any where in the world. Namak pare: you will never find the same taste of Muzaffar bhai. 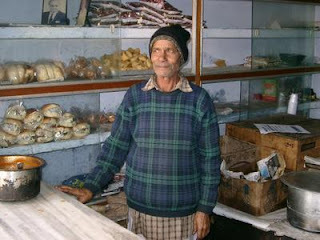 Balu shahi: I tried at many places, but his taste was unique. Jalebi: Other than evergreen sweet shop, there is no other comparison. Samosa: I dont like the taste but people says it was good. Muzaffar bhai didn't know but in school days we used to steal samosa's & biscuit from the counter. It has all gone with the school hood, Myself & many acquaintance of mine attained respectable place in their respective lives, but i am sure, they also miss those days like i do. I found the pic of muzaffar bhai & now posting here.